﻿﻿These guidelines will help you to have a successful, rewarding experience learning an instrument. These are practical tips that we have discovered from years of teaching many students each year. ﻿﻿﻿﻿﻿﻿﻿Adults can start any instrument at any time. Their success is based on how willing an adult is to commit to practicing. For children, starting at the right age is a key element to the success of their lessons. Some people will tell you the sooner the better but this attitude can actually backfire and be a negative. If a child is put into lessons too soon they may feel overwhelmed and frustrated and want to stop lessons. The last thing you want to do is turn a child off music just because they had one unpleasant experience which could have been prevented. Sometimes if the child waits a year to start lessons their progress can be much faster. Children who are older than the suggested earliest starting age do very well. The following are guidelines we have found to be successful in determining how young a child can start taking music lessons. 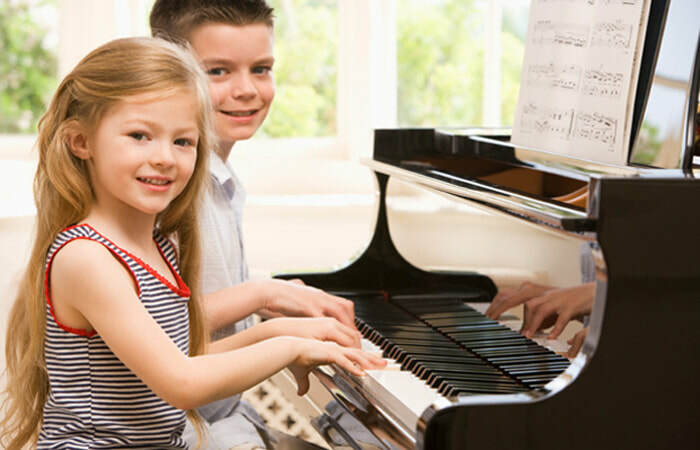 ﻿At our school 5 years old is the youngest age that we start children in private piano lessons. At this age they have begun to develop longer attention spans and can retain material with ease. They are also able to sit on a piano bench for 30 minutes. Eight years old is the earliest we recommend for guitar lessons. Guitar playing requires a fair amount of pressure on the fingertips from pressing on the strings. Children under 8 generally have small hands and may find playing uncomfortable. Bass guitar students generally are 10 years and older. Eleven years old is recommended as the youngest age for private vocal lessons. Due to the physical nature of voice lessons (proper breathing techniques, development of the vocal chords and lung capacity), the younger body is generally not yet ready for the rigors of vocal technique. For children younger than 10, we have a modified private vocal lesson program that teaches them how to use their voices properly, in a fun, relaxed environment. These modified lessons include matching pitches (learning to sing in tune) and singing popular songs while learning to some breathing exercises to get them ready for vocal chord development. The average age of our youngest drumset student is 7. Younger children ages 5 and 6 can learn snare drum. Due to lung capacity (and in the case of the saxophone the size of the instrument), we recommend that most woodwind beginners are 8 and older. We accept Suzuki violin students from the age of 4. Some teachers will start children as young as 3, but experience has shown us the most productive learning occurs when the beginner is 4 or older. We accept viola students from the age of 6. ﻿﻿The trumpet requires physical exertion and lung power. 9 years and older is a good time to start the trumpet. Group classes work well for preschool music programs, theater and theory lessons. However, when actually learning how to play an instrument, private lessons are far superior, in private lessons, it is hard to miss anything, and each student can learn at their own pace. This means the teacher does not have to teach a class at a middle-of-the-road level, but has the time and focus to work on the individual's strengths and weaknesses. For that lesson period, the student is the primary focus of the teacher. The teachers also enjoy this as they do not have to divide their attention between 5-10 students at a time and can help the student be the best they can be. Learning music is not just a matter of having a qualified teacher, but also having an environment that is focused on music education. In a professional school environment a student cannot be distracted by TV, pets, ringing phones, siblings or anything else. With only ? to one hour of lesson time per week, a professional school environment can produce better results since the only focus at that time is learning music. Students in a school environment are also motivated by hearing peers who are at different levels and by being exposed to a variety of musical instruments. In a music school, the lessons are not just a hobby or side-line for the teacher but a responsibility that is taken very seriously. a) Time- Set the same time every day to practice so it becomes part of a routine or habit. This works particularly well for children. Generally the earlier in the day the practicing can occur, the less reminding is required by the parents to get the child to practice. Early in the morning before school is the best time. b) Repetition- We use this method quite often when setting practice schedules for beginners. For a young child 20 or 30 minutes seems like an eternity. Instead of setting a time frame, we use repetition. For example, practice this piece 4 times every day and this scale 5 times a day. The child then does not pay attention to the amount of time they are practicing their instrument, but knows if they are on repetition number 3 they are almost finished. c) Rewards- This works very well for both children and adult students. Some adults reward themselves with a cappuccino after a successful week of practicing. Parents can encourage children to practice by granting them occasional rewards for successful practicing. In our school we reward young children for a successful week of practicing for stars and stickers on their work. Praise tends to be the most coveted award- there is just no substitute for a pat on the back for a job well done. Sometimes we all have a week with little practicing. In that case, there is always next week. Music should be something that you enjoy for a lifetime. So, try not to put unrealistic expectations on yourself or your children to learn too quickly. Everyone le﻿arns at a different pace and the key is to be able to enjoy the journey.